Your life is dominated by your unconscious mind-by thoughts you're unaware of and movements you don't realise you are making. Words, colours, mannerisms and other cues you don't realise are affecting you, change what you think. The confidence you have in your ability to reason and to consciously choose what to do is caused by a series of illusions that scientists are only just beginning to understand. The discovery of these illusions will change the way we see ourselves more than the discoveries of Darwin and Copernicus. 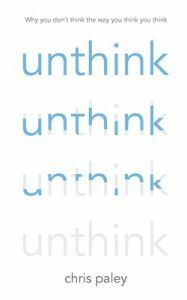 Unthink explores the unconscious decisions we make and covers a variety of topics, ranging from how we choose politicians and romantic partners to more abstract subjects such as whether we can consciously decide to move our fingers. The counter-intuitive observations that Chris makes in the book include? If you want someone to fancy you, wear red and meet them somewhere frightening? When waitresses repeat customers' orders back to them instead of just saying 'yes' they receive bigger tips? To reduce your shopping bill, start at the beer and snacks end of the store and work backwards? If you sit someone in an upright chair when you give them good news they will be prouder of their achievements? Having a picture of your family on your desk might make you work harder, but you'll be rattier when you get home! Chris Paley shows us how we can understand ourselves and others better, by having a greater understanding of the way that the unconscious mind has an impact of the way we live our lives. Chris Paley is a Natural Sciences graduate from the University of Cambridge. He went on to work in the commercial sector, and then returned to Cambridge to complete a PhD in Evolutionary Biology. He then went on to work for an investment bank. In 2009 he gave up his job and spent the next two-and-a-half years researching how our minds work. Chris has written a series of articles for The Times in which he discussed events in the news and every day life in the context of psychology experiments. Who Rules in Your Life ?